Stafford and his quintet are here for two nights and we go for both. It’s the long-delayed CD release for Taking Chances: Live at the Dakota, recorded here in June 2005. The only change in personnel from the CD is the bass player, Phil Palombi, replacing Derrick Hodge. I learn later that Palombi has just joined Stafford’s quartet; after five years backing singer Curtis Stigers, he has made a big change. This is a terrific quintet. Not only can they play, but they may be the best-dressed group in jazz. They’re here for the CD but don’t limit themselves to those songs. Wednesday’s set starts with a Bruce Barth tune “Let Me Go,” then a fierce version of “September in the Rain,” a ballad arranged by Bobby Watson’s wife Pamela (quoting “Amazing Grace” near the end), and “Everything Happens to Me,” which resolves into a sweet swinging series of solos; Barth is especially delicious. The set ends with Warfield’s “Shake It for Me,” which is on the CD. Hall takes his big solo of the evening. Someone please tell me why the drum solo always comes at the end. 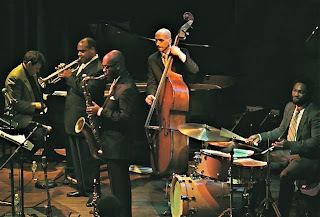 We arrive late on Thursday and this time hear more from the new CD: “Paper Trail,” written by Hall; the jazz standard “Old Folks” (which I most recently heard Irv Williams play, and it’s also on his latest CD, Finality). 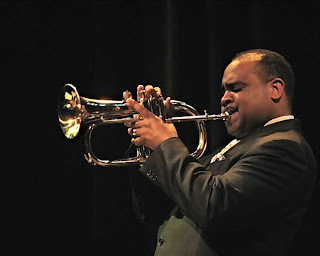 For “Old Folks,” Warfield steps back and Stafford mutes his trumpet; it’s sweet and wistful. Stafford’s solo at the end is so beautiful the crowd goes totally silent to hear every note. Once more, Warfield’s “Shake It For Me” ends the set. In two nights of stellar music, the most pleasant surprise is Palombi. I have always enjoyed hearing him play as part of Stigers’ trio (which, in fact, is the way I prefer to hear Stigers—with a trio, not with accordion and celeste and B3), but I’m seeing a whole new Palombi as part of this quartet. He has a lot more to do, he’s stretching out big-time, and he can’t stop smiling. When you back a singer, the singer is almost always the one in the spotlight. I think this new gig will give Palombi the specific and concentrated attention he has probably deserved for a long time. I'm going to make him a hat. Stafford on the flugelhorn; the quintet. Photos by John Whiting.